Instantly evens and brightens complexion, blending away imperfections. Covers and corrects skin tone while reversing signs of aging and diminishes pigmentation, sagging and fine lines. UVA/UVB protection from Broad Spectrum SPF30, as well as antioxidant protection. inflammation and improves skin firmness, complexion, and hydration. 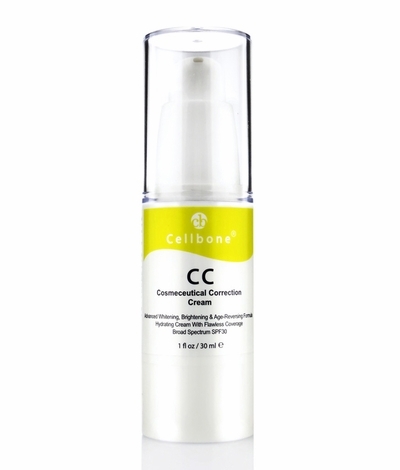 Cellbone Cosmeceutical Correction Cream is a unique complexion correcting cream infused with luminous, weightless, color coverage plus innovative biomimetic peptides to offer skin whitening, brightening and lifting benefits to attain a flawless, smooth complexion on tight, youthful and resilient skin. CC Cream instantly minimizes the look of imperfections and corrects uneven skin tone and pores, all while moisturizing and nourishing the skin and providing antioxidant and SPF protection. After using Cellbone's Hydration Gel and/or Moisturizer, apply a small, smooth layer of CC Cream to clean face and neck 30 minutes before sun exposure and blend evenly.